How do the envelopes come packaged - box or other? It depends on the quantity ordered. Over 1,000, and you will receive a case (box) of envelopes. If less, you will receive it in either a smaller box or shrink wrapped. You'll be singing like a canary once you get your hands on these yellow #6 3/4 envelopes! That’s right. You’ll be so excited that you'll want to tell everyone the great news! Yellow always brings a smile on everyone's face, and these shades of yellow sure will. Whether you pick our Canary Yellow to make a sweeter and lighter message or choose our fancy, statement worthy Goldenrod, these yellow envelopes will make anything you put inside all the more impressive. The yellow 3.625 x 6.5 envelope size is great for when you want to send smaller invitations, thank you cards, letters, even tiny flyers for your business! The short commercial flap fits for all of your business needs and the gum closure will secure those documents and seal them tight! 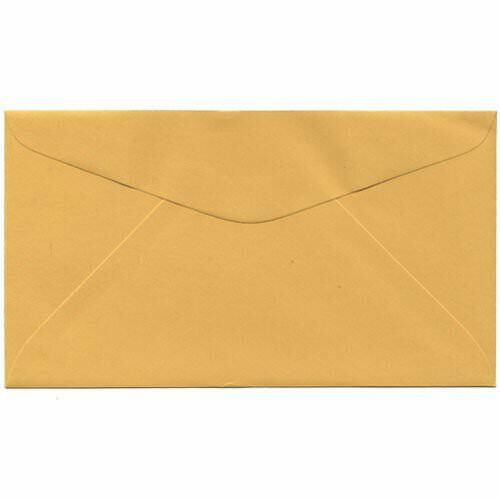 So show off with our pleasing yellow envelopes, they are sure to make everyone's day a little brighter. Yellow #6 3/4 Envelopes - 3 5/8 x 6 1/2 - are available in Canary Yellow or Goldenrod.